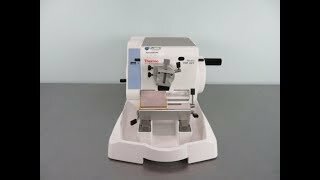 The Mircom HM 325 S Rotary Microtome delivers high section stability and precise sectioning for both paraffin and manual hard sectioning techniques in one easy to use instrument. This rotatory microtome can be used by either left or right-handed operators, and lets users choose from a thickness range of between 0,5 µm and 60 µm. The thickness is constantly monitored in a digital window just to the side for quick sight checks. The Mircom HM 325 S features zero backlash vertical movement with specimen retraction for easy ribboning and an increase in the overall quality of section. The Mircom Microtome features a mechanical positioning feed mechanism, a smooth running handwheel, electronic sectioning counter, one handed fine orientation with zero positioning, and a flat design meant to ensure avoidance of artifacts, even at high cutting forces. The Microm HM 325 S has a simplified design that reduces the number of confusing levers. The unique knife carrier system lets users choose the right knife for the job, and is simple to set up, orienting levers to either the left or right side for comfortable use, and all compatible knives come with finger guards for user safety. The removable waste tray with ergonomic arm rests, makes for quick, effortless clean up. Specimens in this rotary microtome can be rotated 360°, oriented at a universal 8°, and can be changed with one hand. This Rotary Microtome has been fully inpected and is operating without issue all of our lab equipment comes backed with our standard warranty. Should you have any questions, please don't hesitate to contact us.